The Australian Chamber commends the government’s objective to take the lead in best practice for procurement of goods and services. It is important that businesses have confidence in the integrity of the regulatory systems that support commercial transactions, particularly when taxpayers’ money is used to fund these commercial transactions. However, caution is needed when determining the definition of a ‘satisfactory tax record’. 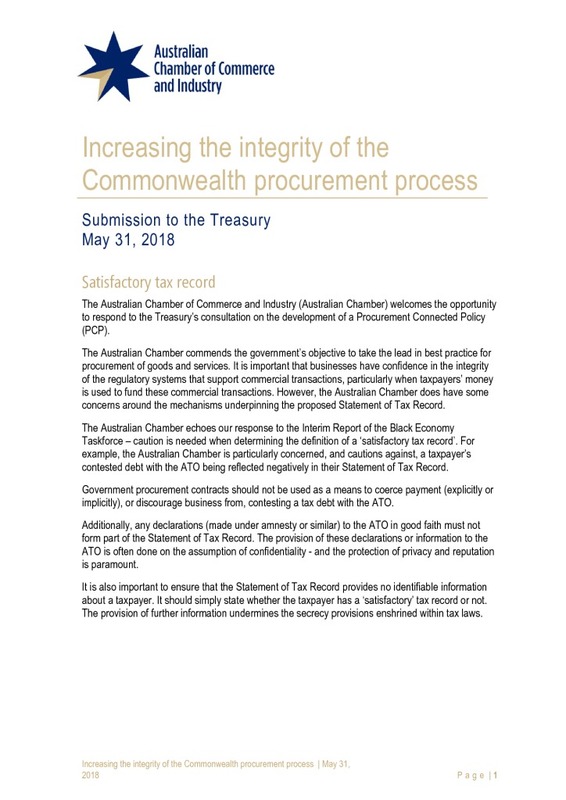 For example, the Australian Chamber is particularly concerned, and cautions against, a taxpayer’s contested debt with the ATO being reflected negatively in their Statement of Tax Record. Government procurement contracts should not be used as a means to coerce payment (explicitly or implicitly), or discourage business from, contesting a tax debt with the ATO.